Flatparty has features like MyRealm (to create groups), Forum (to initiate discussions), Blogs, Polls and Events to enhance the multiple utility of the site and to reach out to non-members. a�?These features will allow people and groups to communicate real time activities and promote collaboration.A�People can expect more powerful and effective features fromA�FlatpartyA�in the near future,a�? shares Toms. 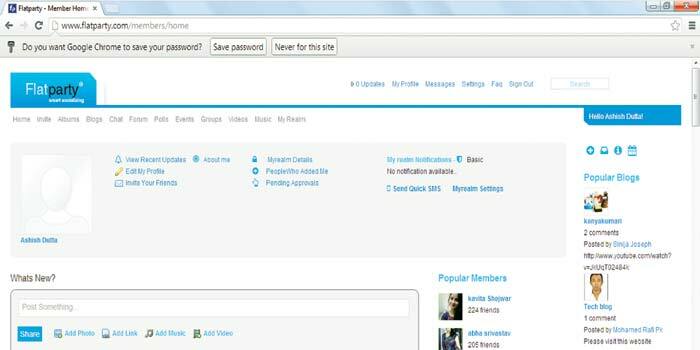 More recently, the site rolled out a new feature that allows a user to invite up to 250 non-members for any event. This will see non-users being part of events as a�?guestsa��, expanding their outreach farther. Theya��ve also started customisable email templates, which makes it that touch more professional than other social networking sites.A�A mobile version of this is expected in the next few months. Details: flatparty.com. Great Article. This site is really cool. I like the event feature. Its easy to customize event template and upload my pics My friends were surprised when I send them invitation, by using guest option. The option to invite non members also is cool feature.